This summer, John Jangala will raft down the west fork of the Gulkana River. He'll be looking for good campsites with a nice view, high enough to get away from bugs, but still close to the water. When he gets there, he'll search for signs of people who stood in the same place a long time ago. An archaeologist with the Bureau of Land Management office in Glennallen, Jangala will spend much of his summer trying to find traces of the earliest residents of the Copper River Valley. What he finds might shed light on the mystery of ancient Lake Atna, which filled the Copper River Basin thousands of years ago. From about 30,000 to 10,000 years ago, Lake Atna, seen in blue, covered most of the Copper River Basin. Image courtesy John Jangala, BLM Glennallen. 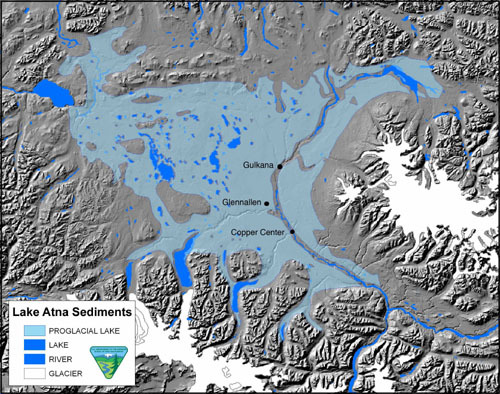 In 1898, Frank Schrader of the U.S. Geological Survey found fine sediments in the center of the Copper River Valley that suggested that an "inland lake" or an "arm of the sea" drowned the lowlands that now include the towns of Glennallen, Gulkana, Copper Center, and Tazlina. Since Schrader's exploration, geologists have found traces of old shoreline at today's 2,400-to-2,500-foot elevations. During its lifetime, about 30,000 to 10,000 years ago, Lake Atna probably covered about 2,000 square miles of the floor in the Copper River Basin, according to a USGS paper Oscar Ferrians wrote in 1989. At Atna's high-water mark, when glacial tongues stuck into it from every direction, the lake was larger than Delaware. Lake Atna lived and died at the whims of great icefields. When the climate was cold enough for glaciers to dominate the landscape, ice provided an effective dam for Lake Atna. When ice receded, especially glaciers that acted as gates for the Copper River-such as the Allen, Miles and Childs -the lake drained to the Gulf of Alaska. Records of ancient peat moss suggest this last happened about 10,000 years ago. In the Tangle Lakes area, east of Paxson and north of the Copper River Basin, archaeologists have found signs of people dating back beyond 10,000 years ago. The earliest evidence of people in the Copper River Basin is from about 1,500 years ago Jangala said. The ancient people of Tangle Lakes may have hunted caribou of today's Nelchina herd in a valley between the peaks of the Alaska Range and the northern shore of Lake Atna. "Maybe that was a corridor for people to ambush the caribou," Jangala said. When the lake receded, the caribou might have wandered over the new ground, and people would have followed them into the Copper River Basin. Jangala hopes those ancient people left behind stone tools or other evidence of their hunting lookouts and campsites. "We should be able to find some kind of evidence of human occupation on the lake margins," he said. Jangala chose to float and explore the west fork of the Gulkana River because it cleaves the upper Copper River basin in two until it flows into the big river near the village of Gulkana. "The Gulkana cuts a geologic transect across the basin," Jangala said. Lake Atna was about twice the size of Iliamna Lake, the largest in Alaska today. But Lake Atna wasn't even the biggest lake to have covered the region, Jangala said. Also dammed by glaciers, Lake Susitna covered much of the low terrain between the Alaska, Chugach, and Wrangell mountain ranges from about 50,000 to 30,000 years ago. "Lake Atna was probably a remnant of Lake Susitna," he said. This column is provided as a public service by the Geophysical Institute, University of Alaska Fairbanks, in cooperation with the UAF research community. Ned Rozell [nrozell@gi.alaska.edu] is a science writer at the institute.